Laura (1944) and Gilda (1946) are women-in-waiting at the edge of cinema history and you'll find them in any of several critical lists of Top Film Noirs or Film Noir Favorites and Film Noir Classics. I should perhaps retract that crap right now, because leading film historian and the boss of noir Eddie Muller has included neither of these two films in his '25 Film Noir that will stand the test of time'. See Eddie Muller's Top 25 Noir Films that will stand the test of time, here. However, the Internet ain't short of alternate lists and you'll find Charles Vidor's Gilda at #13 in Paste Magazine's 100 Best Film Noirs, with Otto Preminger's Laura sitting pretty at #9. See that full list from Paste Magazine, The 100 Best Film Noirs here. The British Film Institute (BFI), a well-trusted source for cinephiles and buffs of all stamp, has both Laura and Gilda rocking into its Top Ten of the best film noirs. See that full list at bfi.org.uk here. And film critic Tim Robey, writing at The Telegraph, includes Laura on his best film noirs of all time list. That list by Tim Robey at The Telegraph can be seen here. Jeez, I could go on all day, but I think I've made my point. For the record, gals and gallows, these lists aren't consistent at all, and most of these include French noir, neo-noir, and some other bits and pieces that aren't considered entirely 'canonical'. But Laura and Gilda both appear to be seminal film noir. Here we'll see why Laura and Gilda continue to feature on such lists, and remain film noir favourites, shocking, fun and moodily melodramatic to their murderous cores. Psychoanalysis, overtly and covertly, plays its part in film noir. From the day Freud first spoke in America, in 1909, his theories had been spreading gently in many directions at once. After World War One, for instance, Edward Bernays and others had introduced psychoanalytic ideas into popular culture, within advertising. In the following decades, psychoanalytic ideas (eg: importance of sexual motives, dreams, archetypes etc) worked their way into American life via fiction, and gradually, entering discourse and achieving medical respectability. So it was inevitable that they should roll into the nation's film stock also. The thirties and forties also saw an influx of European emigre psychoanalysts fleeing the Nazis, and as is well documented elsewhere, many emigres from the German film industry (such as Fritz Lang) transferred their skills to Hollywood, giving birth to noir in the process. Finally, there is the medium of film itself, which perhaps than any other art-form resembles a dream, and can represent the unconscious with its motifs, collages of imagery, and emotional impact in terms of the sexual longing, fear and archetypal portrayal of relationships. The two movies Laura and Gilda however reflect psychoanalytic theory in very different ways. Preminger's Laura is a melodrama with a murder at its centre, but more than most film noirs of the era, seems to represent a dream. First there is the implication that the film, or indeed Laura herself, may be a dream, and there is the fact that Dana Andrews' character does not fall in love with the young woman Laura, but falls in love with the portrait of Laura. For another example of that, see Fritz Lang's classic psychological / psychoanalytic film noir The Woman in the Window. Gilda takes a different tack on these analytic slopes, and is the only film noir I can think of, other than Woman in the Window, to openly mention psychoanalysis, and have one character (Rita Hayworth's Gilda) psychoanalyse another (Glenn Ford's Johnny). Gilda is a wanton woman who is volatile, unpredictable, dangerous, seductive, dismissive, vulnerable, and a full host of other extremes. 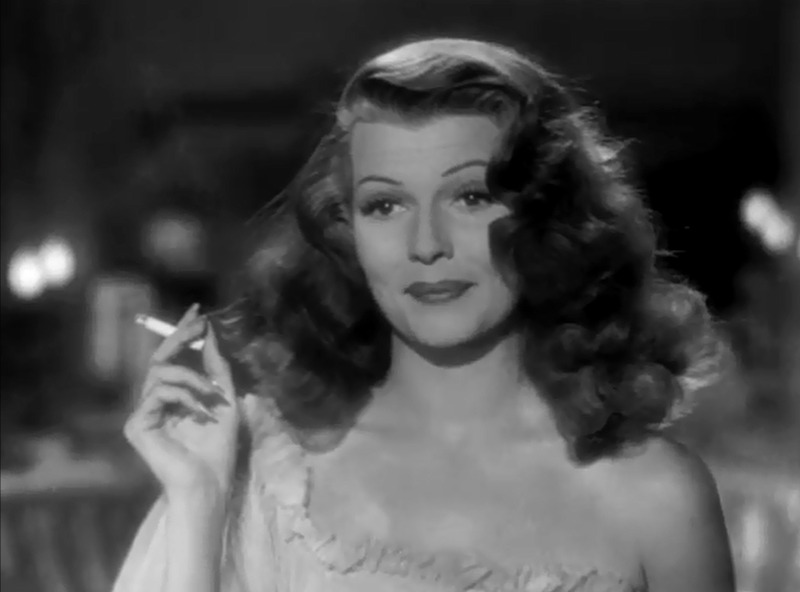 In real life, and perhaps as a result of this arresting psychological portrayal, Rita Hayworth became the No 1 pinup of the decade, which was great for the studios and her own celebrity, but is a moot achievement in most other senses. Shame on you Johnny. Any psychiatrist would tell you that your thought associations are very revealing. Any psychiatrist would tell you that means something, Johnny. Sure I heard what you said: you're going to take me out and pick me up - all to protect Ball. Who do you think you're kidding Johnny? The men try hard to treat her as a chattel (and we can assume the uncharacteristic 'happy ending' means this continues for her) and yet that surface doesn't take much scratching before an entanglement of confusions emerges. Next time in Gilda vs Laura we'll look at their credentials as femmes fatales, and see how the shoe fits the showgirl in both cases.